No trees, shrubs, or bushes may be planted on or around graves without the written permission of the Association. Flowers may be placed only at the base of a family monument (headstone), and may not extend more than 12” from the front of the base of the stone. No glass, ceramic, or plastic containers shall be used for flowers or grave decorations. Artificial flowers are permitted only during the winter months (November 15th through March 15th). Summer decorations must be removed by November 15th. Winter decorations must be removed by March 15th. All unauthorized decorations or plantings may be removed by the Association. No eternal flames or similar features/decorations will be permitted. Single Grave – For a single grave, no more than a 30” length base; a height of no more than 32” from ground to top, slant or upright stone. For a grave, there can be either a headstone or a flush foot stone, but not both. Multiple Grave For a multiple grave site, there may be a single family monument in the center of the graves. Height of this monument shall not exceed 48” from the ground. It is permissible to have a single flat flush foot stone for each burial within that family section. Corner Markers – Corner and name markers must be flush to the ground. Corner markers shall not be permitted in newly expanded Section 9. Monument Suitability – The Association shall approve the suitability of all stones, monuments and markers. Monument Installation – No stone, monument or marker shall be installed unless all cemetery fees are paid and with final approval of the Association in writing. Approval of Monument – No stones, monuments or markers may be placed in the cemetery until a print or a representation has been submitted to the Superintendent and the Association for their written approval before any work can be done. Foundation Installation – All foundations for monuments must be installed by the Cemetery Superintendent. The cost of the installation will be paid to the Superintendent by the monument company. Markers in Section 9 – Markers within newly expanded Section 9 must be installed flush to the ground and shall be 12 inches by 30 inches in measurement. In general, no portraits or likenesses of people, places or things will be permitted on monuments without the written permission of the Association. All burial plots within newly expanded Section 9 shall be double depth graves. All burial plots in the cemetery other than Section 9 shall be single depth. The Association shall have the right to select the location of interment. Columbarium niches are available to hold urns containing cremated remains, at prices established in Prices and Fees(Appendix A). It is the responsibility of the niche owner to insure that any urn purchased for the purpose of placement in the niche will fit said niche. Only the right of sepulture is sold by the Association; the cemetery retains ownership of the columbarium and all of its parts, including the face plates of the niches. The terms “purchase”, “sale” and “owner”, when used in these rules and regulations, refer to the purchase and sale of the right of sepulture and to the owner of the right of sepulture. Each niche will be permitted to hold a maximum of two cremation urns. All inscribing of faceplates will be performed through the Association only. All orders for faceplate lettering shall be placed in writing on forms approved by the Association. The Association shall approve all lettering on faceplates in order to insure uniformity. Faceplates shall be inscribed on-site by an engraver approved by the Association. Inscriptions are done at an additional cost to that of the columbarium niche. Such additional fee will be assessed by the Association to the niche owner. The charge for inscription shall be paid in advance prior to the inscribing of the faceplate, at a rate established in Appendix A.
Font styles may vary, but font sizes must be 1½ inch, 1 inch and ¾ inch only. Lettering on the faceplates shall consist only of the decedent’s name, and the dates of birth and death. Additional inscriptions for military service or other significant information may be permitted at the discretion and written permission of the Association. Faceplate inscriptions must be inscribed into the faceplate itself. No additional plaques attached to the surface of the faceplate will be permitted. The Association may repurchase empty niches whose face plates have not been inscribed with lettering at the price paid for their original purchase. The Association will not recognize attempts to transfer niches to third parties. Contact the Association President for information. All visitors will respect the solemnity of the cemetery and strictly observe the rules which have been established for the purpose of securing quiet and good order at all times within the grounds. The right is reserved to control all admittance to the grounds. Nothing may be brought into or removed from the cemetery without permission from the Association. Vehicles such as snowmobiles, motorbikes, motorcycles, motor scooters or a sport vehicle will not be allowed in the cemetery. This also includes horses. Any exception to this General Rule may be made only at the discretion and with written permission of the Association. No person shall sit on, deface, deposit rubbish on or otherwise make unsightly any monument, flowers, trees, or any other property in the cemetery. No responsibility for their protection is assumed by the Association. 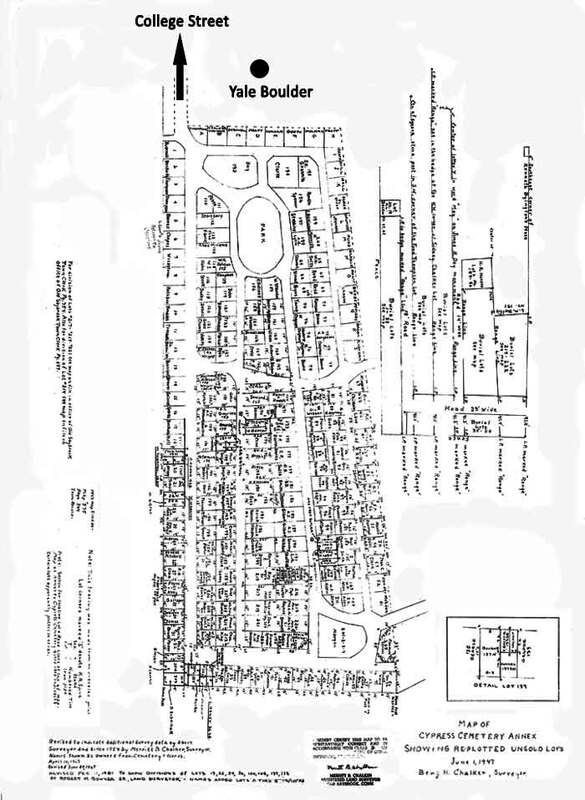 Burial plots in the newly expanded cemetery Section 9 shall be reserved for current or past residents of the Town of Old Saybrook. Exceptions to this General Rule will be made at only at the discretion and with the written permission of the Association. Relocation of buried remains within Cypress Cemetery (other than cremains) is generally discouraged and will only be permitted with the written permission of the Association. Purchase of burial plots within the newly expanded Section 9 shall be limited to four plots, each required to be double depth, for a total of eight burial locations. Exceptions to this General Regulation will only be at the discretion and with the written permission of the Association. A gravesite may be purchased in a non-cremation area to be used for no more than four (4) cremations – and allowing only one stone per gravesite. All full burials shall occur in concrete vaults or equivalents that must be approved in writing prior to burial by the Association. No dogs are permitted unattended in the cemetery. Visitors must clean up after their dogs. Children are not allowed in the cemetery unless accompanied by an adult. The cemetery closes at sundown. Mowing and maintenance of grass, hedges, shrubbery, trees, and general maintenance of the grounds. Seed new gravesites after they have been prepared by the grave digger. Any graves dug between November 1 and March 30 will not receive final dressing until the ground is dry and settled – by April 30. The Association periodically will refill and seed any graves that have settled. Fall and spring clean-up will be done by the Association. Removal of funeral flowers, removal of winter decorations by March 15; summer flowers by November 15. The Association does not provide weeding of individual flower holders, watering of individual flowers, or plants, nor application of pest deterrents.